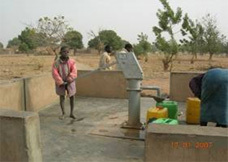 A water well or a borehole is a vertical capture engineered structure used to exploit the water from a water table held in the interstices or in the cracks in a rock in the sub-soil known as aquifer. The water can be raised to ground level either very simply using a receptacle (a bucket, for example) or more easily using a manual or motor-driven pump. Wells and boreholes vary tremendously, be it in depth, the volume of water, the cost or the purity of the water, whether or not treatment is justified before it can be consumed (and should also be checked regularly, not just when the structures are completed). 2) Who use this means and since when ? What is the difference between a well and a borehole ? 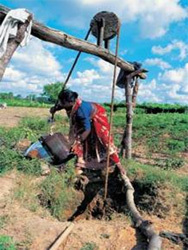 Wells dug manually are some of the oldest sources of a water supply. The first wells were simple holes with no protection against collapsing ; they failed to withstand the weather and therefore disappeared. Wells dating from the Copper, Bronze and Iron Ages that are found all over Europe are far more numerous. - There are in fact three major categories of well : dug wells, driven wells and drilled wells, commonly known as boreholes. 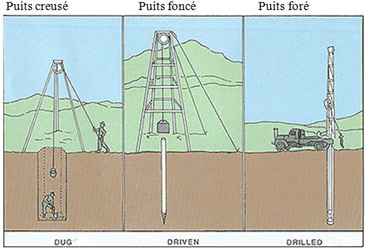 The choice of engineered structure depends basically on the depth of the aquifer water table (it would be extremely difficult or dangerous to have well diggers dig a well more than 30 m deep by hand), hydrogeological data of the land, whether or not speed is sought and the cost of the operation. A well dug by hand with the participation of the population frequently proves the least costly. Lastly, the opening of a well dug with a pickaxe is far wider (if only so that the well diggers can go down it) than a driven well creating by driving tools into the ground or a borehole where the opening is, on the contrary, narrow given the tools used and the huge depth to be reached. Water may well be present on Earth, but the salt water of seas and oceans accounts for 96.4% of the total water volume. Fresh water only accounts for 3.4% of the total volume of water on our planet. - A very small amount (0.001% of the total water) is contained in the atmosphere. In most cases, and where there is a lack of surface water, a well or a borehole proves to be the most efficient method to obtain fresh water resources, which is very frequently better quality that a surface water more liable to pollution. People living in regions with little surface water and sufficient groundwater resources. 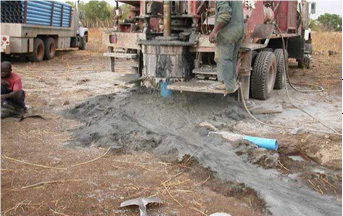 - drilled wells or boreholes. Digging in the ground with a spade and a pickaxe is the most simple and oldest technique. It is also the most tiring as well as the least costly. The soil has to be relatively soft and the water table fairly shallow. These wells are often edged in stone to reinforce them and prevent them from collapsing, but it is far better to case them (keep them vertical) with concrete rings often produced easily on site using moulds. Less rustic mechanical digging resources can also be used to reduce the considerable physical effort. 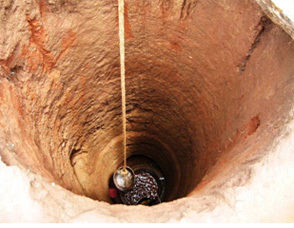 Dug wells are not very deep (between 10 and 20 m usually, 30 to 40 m exceptionally). As they are fairly shallow, they risk being contaminated and can dry up more easily than the other types of well. Driven wells are constructed by driving a small-diameter, perforated tube with a pointed end into friable ground like sand or gravel using a vertical to-and-fro movement (except for the special undercutting technique). A filter, or screen, is very often fixed to the lower section of the pipe to filter the sand and other particles and prevent them from penetrating into the well. They can only draw the water from average depths of between 15 and 100 m depending on the technique used. Like the dug wells, they are also exposed, but less so, to contamination and drying up. - Percussion driving :percussion involves driving a tube with a pointed end by letting a heavy tool (the bit) fall regularly on the end of the tube. - Water injection (or water jetting) driving : the process involves injecting water under pressure inside a tube to facilitate digging the soil and removing the spoil. Undercutting involves digging the soil at the very base of the tubing in a vertical position which thus is driven in under its own weight. A large number of modern wells are drilled, meaning that they are dug by percussion of a tool in the soil or by the rotary action of a cutting tool (augur, drill bit) revolving around a vertical axis. This breaks and chews the rocks, with the residues usually brought up to the surface by sludge. They can be up to 300 m deep. - These drilling methods are often mounted on large, well-equipped lorries. They use rotary drilling tools that chew or break the rocks or firstly, if the soil is soft as is often the case when drilling commences, large augurs. The boreholes can be several hundred metres deep. A pump is often installed at the bottom to pump the water up to the surface. - The geological characteristics of the ground to be drilled : hard rocks, soft and crumbly rocks, sandy ground, etc. - The technical resources potentially available on site and their cost. The lack of timely servicing and repair of a well can reduce or even halt definitively pumping or drawing of water due to breakdowns in operation. It also downgrades the quality of the water and therefore causes illness. It results in several tens of thousands of dug, driven or drilled well being abandoned worldwide every year. The various processes all have their advantages and drawbacks which are detailed in the miscellaneous presentation sheets on the different well types. 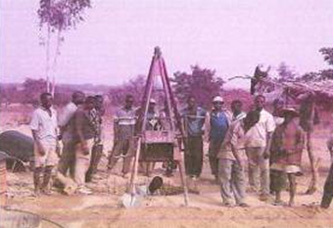 The cost of a well varies according to the geology of the site, the technique used, the purpose of the well (daily volume of water), the country, the cost of manpower and whether or not it is fitted with a pump. The price range is very wide, from about €500 for a hand-dug well with no pump about ten metres deep to more than €13,000 for a mechanised borehole with a pump some hundred metres deep. As the dug and driven wells can only draw water from a shallow or medium depth (less than 40/45 m as a rule), they are more exposed to contamination from human activities and to drying up during periods of drought. In unstable ground, the walls must be consolidated (liner, casing) with a coating to avoid the well collapsing or being obstructed. This study examines the importance of manual drilling operations on the improvement in the drinking water access rate in Chad and has highlighted that the predominant use up to 2002 of costly conventional drilling techniques (mechanised) may not satisfy the demand for water throughout the entire country. - WHO (World Health Organisation) : The Health Technician Manual.